Lady Agatha Wayland fingered her diamond ring nervously. The engraving on it was barely noticeable next to the grapefruit-sized diamond, but never failed to help her: WWBD. What Would Buffy Do? Buffy would be confident. Buffy wouldn’t act suspicious. Buffy would walk around with her head high despite the weight of the Golden Gate Bridge in a secret compartment in her brassiere. Buffy would not call attention to herself. Carmen “Buffy” Sandiego would ask a perfectly normal question, and fly as if on a perfectly normal holiday. Agatha touched her ring, and stuck out her chest as if it didn’t weigh 887 000 tons. “I’m planning a taco party. I’ll just take a few pounds of ground beef.” She took the beef and ran out of the shop before her confidence dissolved, not so much forgetting to pay as reverting to an old habit. Okay, new tactic. She sped away in her Denghby speedster convertible, hoping the butcher wouldn’t call the police over a bit of beef. She tried to think of the least-obvious city to escape to. With any luck, ACME Detective Agency’s headquarters were on the other side of the now-bridgeless Bay, so their super sleuths would take some time to get to her, but she still had to get out of San Francisco quickly. What would Buffy do? She’d get rid of the loot, that’s what she’d do. Agatha tried to think of places with bays or rivers in need of bridges. Hudson Bay had already been stolen by Fast Eddie B. a few years before, so that was out. Where were there rivers? Didn’t ‘Rio’ mean river? Perfect. She called a henchman to arrange a plane ticket to Rio de Janeiro and a fake passport. Half an hour later, Agatha was browsing mystery novels in a bookstore when she caught a henchman’s eye between the shelves. He passed her a book titled ‘1001 Perfectly Legal Ways to Make $35 Million’ and shuffled off. She put the book into her secret coat pocket, and went to the counter with a novel, and a Portuguese phrasebook to help her out in Rio. Her speedster was gone by the time Agatha left the bookstore. Surely taken away by the henchman and prepared for smuggling to Brazil. Agatha opened the book the henchman had given her, and found it had been hollowed out to make room for a passport, a plane ticket, and a pair of disguise glasses. V.I.L.E. never let her down. Lady Agatha Wayland felt good. She had a destination. She had a plane ticket. She had a fake passport. She had the bridge hidden in her bosoms, where nobody would dare search. She had a safe way out of this place, and the police probably didn’t even have a warrant for her arrest. Compared with the native San Franciscans, she looked downright boring. To blend in a little more, she stopped at a Starbucks and ordered a frappuccino and a limousine to the airport. The only crime she needed to worry about was in the murder mystery she was reading. Agatha felt a familiar thrill as the limo flying a green, blue and yellow flag pulled up. Soon she’d sell the bridge and live like a queen again. She should be able to live at least another twenty years before needing to pull another heist. She grew more and more confident as she checked in for her flight. Her luggage was respectably underweight, and her passport passed the security tests. Despite surprise at the new procedures, she obligingly removed her tennis shoes and cockily presented her hastily-prepared clear plastic bag of perfectly innocuous bottles of liquid — just a little shampoo and some diamond polish. She strutted through the metal detector, knowing she’d left her knives in her checked-in luggage, and the Golden Gate Bridge was safely masked within her chest TARDIS. Millimeter wave scanner? Agatha cursed her habit of rarely reading past the crossword page to the Life & Crime section of the V.I.L.E newsletters while she was out of the game. Agatha was ushered into a small room by two female security agents. One of them patted her down, paying extra attention to her chest area. When they asked her to remove her top, Agatha was at the same time white with fear and blushing, which gave her a somewhat normal appearance. No doubt newer chest TARDISes were thinner and lacier than her decades-old model, but Agatha never bothered with the fashion pages of the newsletter either. The agents prodded at her rock-hard brassiere, looking for secret pockets. Until one of them found the button. The Golden Gate Bridge exploded out of the bra, destroying a large section of the airport and bopping a taxiing plane into the Bay. Agatha was thrown back by the force unleashed by her undergarment, and was quickly detained by unfazed security personnel without so much as an arrest warrant. The airport bridge became San Francisco’s most famous tourist attraction. In a bid to win back some of their tourism dollars, Alcatraz Federal Penitentiary erected a particularly Carmen-Sandiego-esque statue of Agatha in one of their rooms, claiming that she had been held at the prison after the attempted heist. Carmen Sandiego started up a legal landmark-moving business with the slogan ‘Anywhere in the world’, and became richer than ever, eventually starring in a business startup reality show entitled ‘What Would Carmen Do?’ Lady Agatha Wayland spent the rest of her life conning other Guantanamo Bay detainees into giving her advance payments on the bridge they needed to cross the bay. 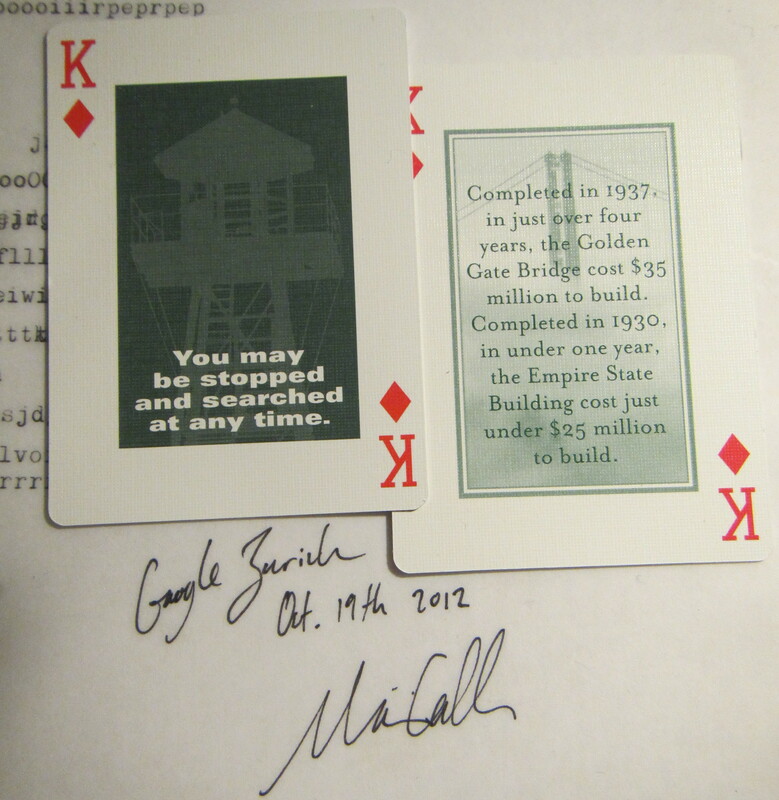 I asked Marian Call and Scott Barkan to choose cards for me after their Google Zurich concert on October 19, intending to write something on the way home. Without realising it, they both picked cards that had been given to me by one of their fans on JoCo Cruise Crazy 2; one comparing the cost of the Golden Gate Bridge with that of the Empire State Building, and one stating that prisoners at Alcatraz may be stopped and searched at any time. I found the comparison on the first card to be a bit weird; unsure why those two costs were being compared and what we were supposed to make of them. The second card reminded me of airports in the USA. Eventually it hit me that the people most interested in the relative costs of these landmarks would be villains from the computer game ‘Where In The World is Carmen Sandiego?‘ which I played a lot of on the Macintosh SEs at school in the early 90s. They’d often steal rather cumbersome items such as Hudson Bay or the Statue of Liberty. Clearly the card was telling me that if they had the choice of stealing either the Empire State Building and the Golden Gate Bridge, they’d go for the bridge. And the other card told me what would happen to them if they tried. I understand there are newer versions of the game, and also a TV show. This story is specifically based on the 1985 version of Where in the World is Carmen Sandiego that I played on the old Macs. I used this manual and this walkthrough for reference. Only after publishing this did I find this reference, which has all the country clues I’d been looking for a list of. I changed the mention of the Brazilian flag accordingly. I didn’t manage to write the story on the way home from the Zurich concert, because I needed internet access to remind myself of some of the clues, locations and police dossiers in the game, and my phone was low on battery. The next day Marian and Scott came to CERN to give a concert, and the day after that they recorded some footage for a music video, so I was too busy (having fun) to write. I was busy for most of the rest of the week and out most of the next weekend as well, so this is two weeks late. That did mean I got to listen to PopStuff’s podcast on video game nostalgia while still working out some details, so that was interesting. I almost forgot; I found out from a Bosnian colleague that a few days before I came up with this story idea, an actual bridge was stolen in Bosnia. This entry was posted on November 4, 2012, 6:43 pm and is filed under Alcatraz Rules and Regulations, Golden Gate Bridge, Writing Cards and Letters. You can follow any responses to this entry through RSS 2.0. You can leave a response, or trackback from your own site.